We had dinner last night at the venerable Denver Press Club with Jennifer 8.Lee and learned about Chinese food. The dinner was Chinese takeout, of course, from a DU-area eatery called “Hong Kong Cafe.” It was pretty good. The dinner was organized by John Ensslin, president of the Colorado chapter of the Society of Professional Journalists. The unfortunately small gathering was treated not only to good food and conversation, but a wonderful and entertaining presentation by Lee, a New York Times Metro reporter who has just published her first book, “The Fortune Cookie Chronicles,” which is a peek at the cross-cultural pollination that Americans think of as Chinese food. First of all, change your idea of Chinese food. What most people in this country consider Chinese food is really Chinese American food. To underscore the point that Chinese food is more American than apple pie (as Lee asks, how often do Americans eat apple pie, and how often do they eat Chinese food? ), the presentation begins with a startling fact: There are more Chinese restaurants in this country than McDonalds, Burger King, Wendy’s and Kentucky Fried Chicken combined. 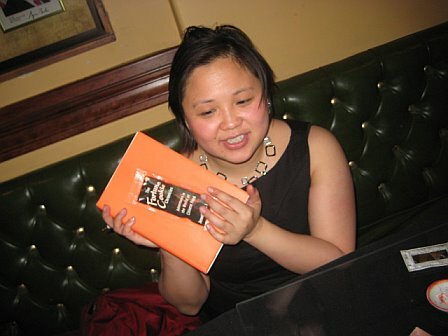 She went on to give an engaging, and often hilarious talk that covered her upbringing as a Chinese American in New York City, and the story that got her to turn her passion for Chinese food into a book: a 2004 Powerball Lottery drawing. It wasn’t the winner of the jackpot that drew her attention, though. As a journalist, she was struck by the long odds for a larger-than-normal group of people to have the same five out of six numbers to make them qualify for the second-place prize. And, out of those people, most even shared the same wrong sixth number. Either this was a cult that shared the same numbers, or a very large family. But the winners were scattered all over the country and seemingly shared no connecting features. Except, that is, that they ate Chinese food, and placed their Powerball hopes on the numbers pulled from their fortune cookies. Lee tracked down the one company that practically monopolizes the fortune cookie business — ironically, it’s close to her home in New York City — and discovered a hard-working Chinese family cranking out zillions of the fortune-stuffed treats for use by restaurants everywhere. She found out who writes the fortunes (the “Analects of Confucius” were too serious and dull, and only offered a few fortunes, so the freelance writers, who are not Chinese, cull them from pop culture, TV, movies, books of famous quotations and yes, greeting cards). She learned more about fortune cookies than you might think is possible, including the origins of the fortune cookie. Because the fact is, fortune cookies are not part of Chinese cultural tradition. When she showed them to people in China, she got quizzical looks. After much research, she discovered that fortune cookies as we know them were invented by a Japanese American. Two businesses, a pastry shop in LA’s Little Tokyo and a diner/pastry shop in SF’s Japantown, claim credit for the fortune cookie. Both seem to have based their idea on a larger but same-shaped folded traditional cookie made in Kyoto, Japan, which put its fortunes in the fold, not inside the cookie. A cultural completist, Lee then wondered how this Japanese-made cookie became such a staple of Chinese cooking. It turns out that Chinese food became all the rage throughout the U.S. in the years before World War II, and so did the fortune cookie, which at first was served as a dessert in Los Angeles and San Francisco Chinese restaurants. The later invention by a Chinese American of a machine to mass-produce the cookies made them so inexpensive they could be given away to diners after every meal. But once the fortune cookie caught on in Chinese restaurants, the production process was interrupted… by WWII, and the incarceration of Japanese Americans from the West Coast. With all things Chinese in favor (since China was an ally of the U.S. in the war against Japan), these slightly sweet morsels were in great demand. That’s when Chinese entrepreneurs stepped in and turned the cookie into a Chinese phenomenon, start-to-finish. It’s a story of a great cultural swap: Over the centuries, Japanese have taken traditions from the Chinese and made them their own, but in this case, the Chinese took a Japanese invention. Lee also explained how the dish “chop suey” is nothing more than leftovers, and that there is nothing called “chop suey” in Chinese cuisine. And, she showed how she followed the trail of the real General Tso whose name graces the chicken dish served in so many Chinese restaurants in America. She found the home of the good general, but learned that the dish was invented by a Chinese restaurant chef in the U.S. The book, which we bought after her presentation, promises to reveal more mysteries of Chinese cuisine (including one I’m dying to know, the origins of the takeout box). It was a pleasure to meet Lee, a vibrant, witty and sharp young woman who also took the time to answer questions about the process of writing the book (she obviously got a nice advance for writing it, because she spent it on flying around the world doing her research). I can hardly wait to sit down with the book while we eat … Chinese takeout, of course!